Microsoft Outlook is a great email client, but getting you email messages out of Outlook has never been very easy. 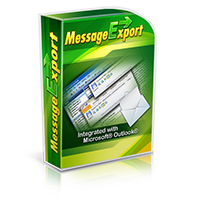 The MessageExport add-in makes exporting email messages much easier. In this tutorial we will show you how to export an entire Outlook email folder to your Windows desktop. The messages will be converted into .msg files, which are invidual Microsoft Outlook email messages. Each .msg file contains a message and all meta data associated with that email, as well as file attachments. MessageExport operates under the idea of Export Profiles. These instruction sets that you select from the MessageExport drop down list. Any Export Profile may be customized, edited, or otherwise changed to fit your specific need. New profiles can be easily created. First choose the profile you want to change and then click the Edit Profile button. Under "Main Export Settings," locate the "Export From" drop down list and select from among the options. 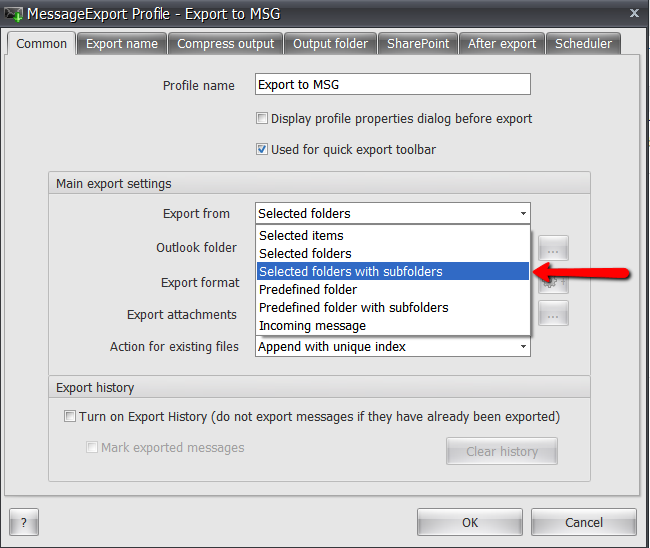 Choose "Selected folders with Subfolders" if you want MessageExport to always export the selected mail folder and any subfolders each time you use this Export Profile. Click Ok. Now when you use this edited export profile in Outlook, MessageExport will always export the entire folder and any subfolders. For more information or free trial, visit the MessageExport product home page.